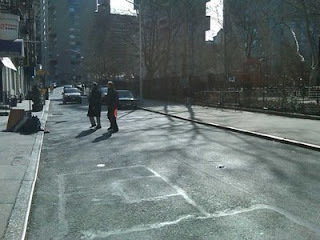 Civic Center Residents Coalition NYC: Government workers have a day off from commuting - Chinatown breaths again. Government workers have a day off from commuting - Chinatown breaths again. What if 85 % - 90% of all government workers, NYPD, and court officers used mass transit? What if it was illegal for government employees to use a personal car to drive to work and park for free? What if any car a government worker needed to use was able to be tracked and monitored? What if City Hall got SERIOUS about traffic congestion and defied unions and political pressure in favor of clear air and free flowing safe streets and sidewalks free of cars parked on them? What if Chinatown's largest park WASN'T ringed bumper to bumper with Government sanctioned personal cars used for commuting? What if NYC led that NATION in putting an end to what Deputy Mayor Ed Skyler calls "a necessary perk we feel balances out moderate salaries paid to our employees"? What if NYC traffic agents could carry out their job free of intimidation from Police? What if bullies with dashboard placards didn't exist? We'd have what you see in these photos. 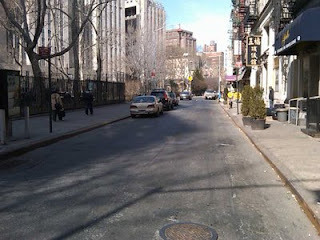 This photo was taken on Mulberry St where NYC has designated this stretch of what used to be public land "for Government parking only".On this public holiday there are no government or court officers cars commuting, and therefore the street is blissfully clear at 12:30pm. On any given weekday government cars that are parked here stay here for the entire day because the cars that park on this stretch of Mulberry St. are used for commuting and commuting only. Until Mayor Bloomberg REMOVES this unnecessary PERK from City employees and NYPD our streets will continue to be overrun with traffic, and pollution and our streets, PARTICULARLY Chinatown's streets will continue to be unsafe. It's time to eliminate the Government Parking Perk. We don't need congestion pricing to make this City better, we need BETTER GOVERNMENT to make this City better !!! Zip car technology for tracking cars exists NOW. When the City starts issuing parking placards with built-in tracking devices, then we'll seen some accountability for government commuter cars spent on our streets. Cost? The City already loses $46-million a year to lost parking meter revenue due to government sector commuters on meters [Schaller Consulting, 2006].